With a modern look and strong design, this vanity will help any bathroom look nicer. The good-looking white marble counter and grey mdf base make a big difference in your bathroom. This set from Bosconi is great for anyone looking for great style and function in their bathroom. Enjoy the popular traditional look in your bathroom with this beautiful vanity. 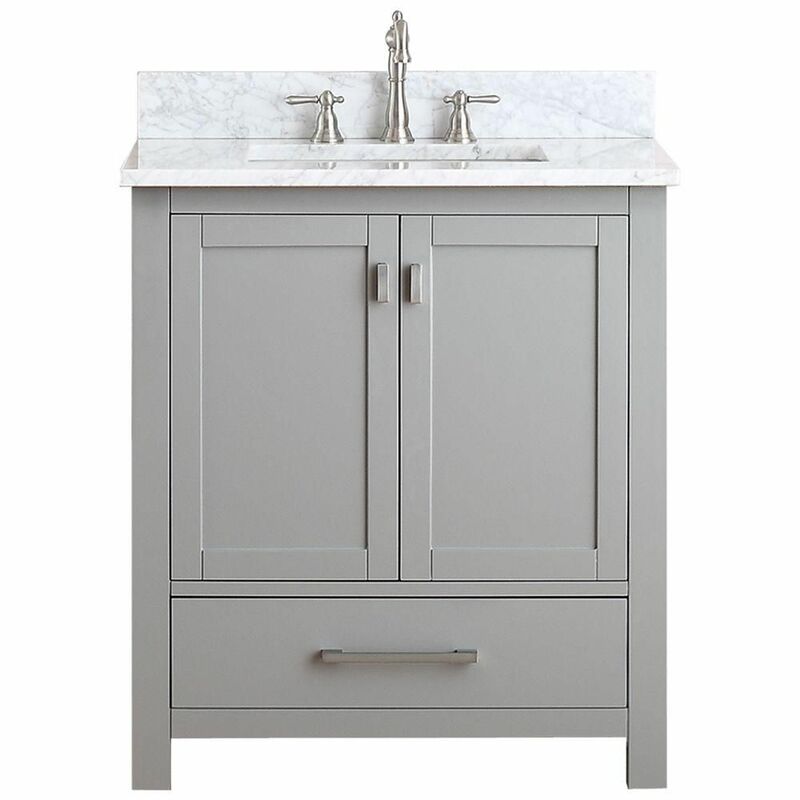 Its beautiful white marble counter and grey solid wood base bring a great new look into your bathroom. Its double-door cabinet and drawers have lots of room to keep all of your bathroom items. Bring a classic look and feel to your bathroom with this beautiful set from Wyndham Collection. This vanity is a great way to add traditional style to your bathroom. This piece comes with a beautiful grey solid wood base and a white marble counter. There's plenty of space for items in this vanity's drawers and double-door cabinet. Make your bathroom look like new with this good-looking, useful set from Wyndham Collection. Modero 31-inch W Freestanding Vanity in Grey With Marble Top in White Enjoy the popular traditional look in your bathroom with this beautiful vanity. With a white marble counter and grey solid wood base, this product is good-looking and useful. Put a classic feel in your bathroom with this good-looking set from Avanity. Modero 31-inch W Freestanding Vanity in Grey With Marble Top in White is rated 4.0 out of 5 by 1. Rated 4 out of 5 by Sandy from Nice cabinet Beautiful cabinet, love the soft closing doors and self closing drawer. sink is a pretty shape and the marble top is really nice quality. Cabinet isn't cheap, but the product is quality. Cabinet is a bit tall for me as I am only 5' 2"